Spray drying is the most widely used industrial process involving particle formation and drying. 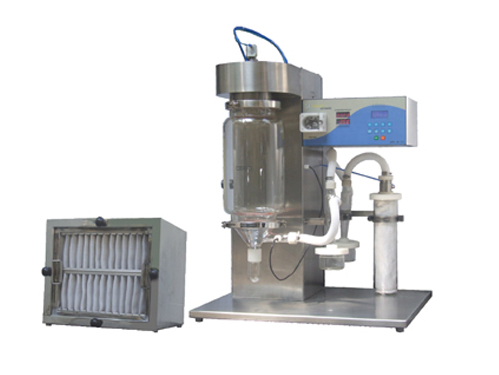 It is highly suited for the continuous production of dry solids in either powder, granulate or agglomerate form from liquid feed stocks as solutions, emulsions and pumpable suspensions. Therefore, spray drying is an ideal process where the end-product must comply to precise quality standards regarding particle size distribution, residual moisture content, bulk density, and par t icle shape in crystal line or amorphous powder. Spray drying involves the atomization of a liquid feedstock into a spray of droplets and contacting the droplets with hot air in a drying chamber. Evaporation of moisture from the droplets and formation of dry particles proceed under controlled temperature and airflow conditions. It is the ultimate solution to R&D and analytical needs and is the key for standardization of product.